Create valuable retail display space that's completely portable! 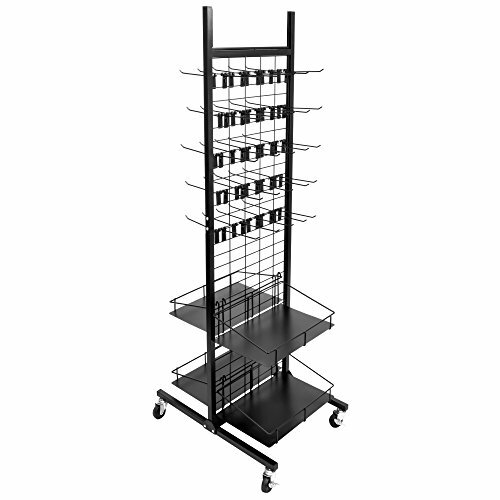 Hang and shelve hundreds of dollars worth of product inside a compact 28" x 28" footprint that goes wherever you need it to. This double-sided display stands 66" tall and features space to insert custom header cards for exciting branding opportunities. Why You'll Love It: Each unit comes with 50 peg hooks and 4 shelves. Completely modular, go ahead and mix, match, and hang to suit your unique business needs. Wheel the display on its swivel casters into a high traffic area, lock it in place, and start converting. Units assemble quickly and all fasteners and hardware is included. VALUE-ADDED: Hang and shelve hundreds of dollars worth of product inside a compact 28" x 28" footprint that moves wherever you need it go!